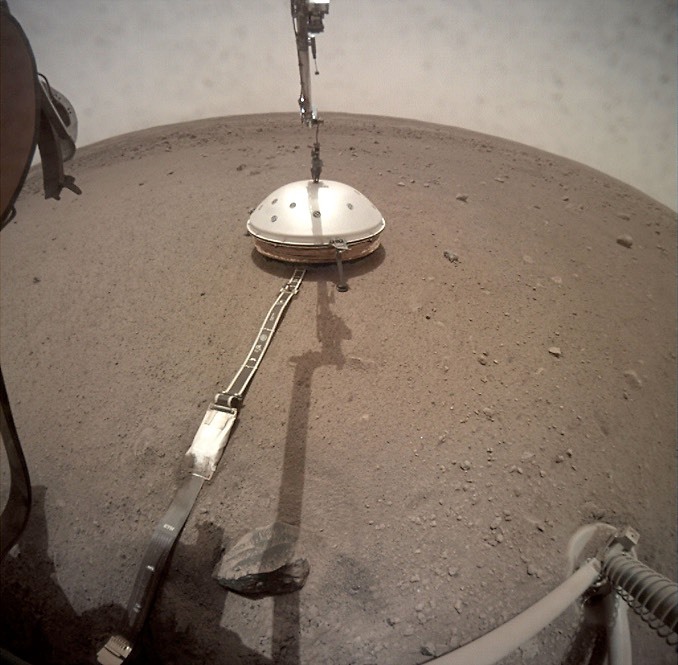 The robot arm aboard NASA’s InSight Mars lander has completed deployment of the Seismic Experiment for Interior Structure, or SEIS, instrument by lowering a protective enclosure over the ultra-sensitive device. Provided by the French Space Agency CNES, SEIS is designed to measure Mars quakes, meteoroid impacts and any other disturbances that managed to shake the red planet, allowing researchers to build up a three-dimensional map of the martian interior. 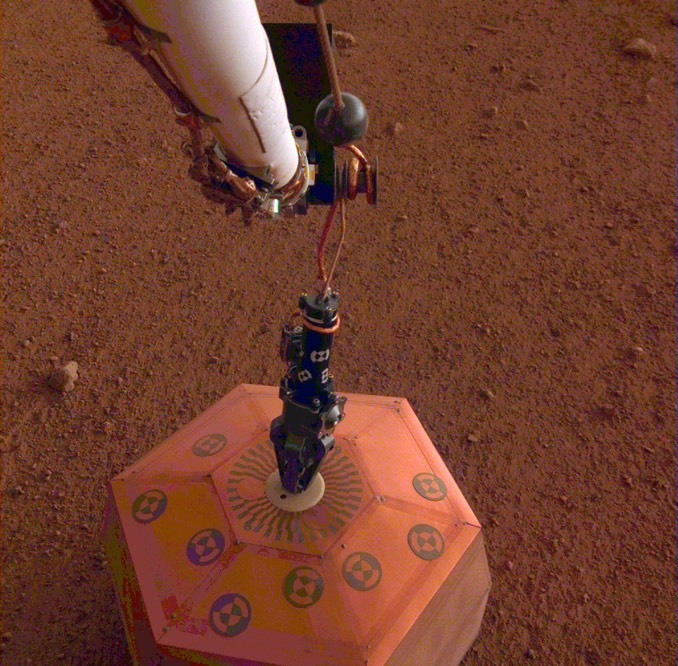 The seismometer was lifted from InSight’s upper deck and placed on the surface 19 December. The dome-like wind and thermal shield seen here was lowered over SEIS instrument on 2 February. Because the instrument measures vibrations on the order of half the radius of a hydrogen atom, it must be protected from external forces like the martian wind and the effects of temperature extremes. With SEIS now in place, engineers at NASA’s Jet Propulsion Laboratory in Pasadena, California, will focus on deploying InSight’s other major instrument, the Heat Flow and Physical Properties Package, designed to hammer itself into the soil near the spacecraft to measure sub-surface temperatures. The instrument was provided by the German Space Agency. 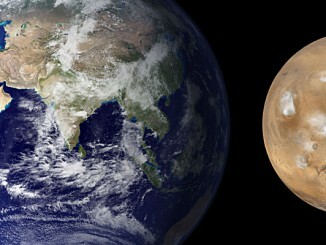 Using a new process in planetary formation modelling, where planets grow from tiny bodies called “pebbles,” Southwest Research Institute scientists can explain why Mars is so much smaller than Earth. This same process also explains the rapid formation of the gas giants Jupiter and Saturn, as reported earlier this year. 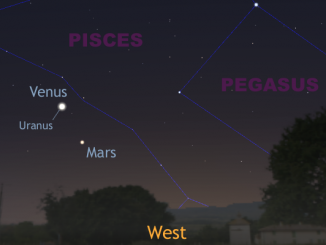 On Wednesday, March 4th, planets Venus and Mars will be easy naked-eye objects in the western sky at dusk, but in a telescope you’ll have the added bonus of spotting gas giant Uranus very close to Venus. 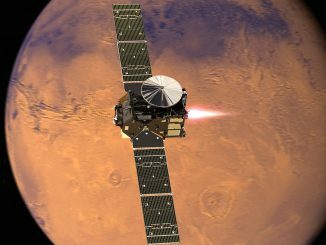 The ExoMars Trace Gas Orbiter, a Russian-launched, European-built spacecraft that arrived at Mars in October, is starting to dip into the upper reaches of the red planet’s atmosphere in a year-long “aerobraking” campaign place the observatory in the right position to hunt for methane, an indicator of potential biological activity.